We are often asked how best to care for your Hampson Woods board – please see below for the key points. If you still need to know more, please just get in touch and we can talk it through. How best to wash my board? It’s fine to wash your board with soap and water. We advise you avoid dishwashers – and never soak it! The whole dishwashing process is a bit harsh (and probably a little over the top) for a natural piece of timber. Soaking the boards will likely warp them (to a certain degree, wood will act like a sponge), and will perhaps discolour them. So please wipe or scrub, with warm water and a mild soap. And allow to dry thoroughly in a rack or by hanging on a hook. Very rarely, a small amount of colour will seep from certain boards. This is a natural tannin from within the wood (trees produce tannins to aid their growth and as a predatory precaution). This has only been brought to our attention once, and will stop happening after a few uses and washes. We advise to keep off any best linen while the board is drying! My board went fuzzy after I wet it. Why? Natural fibres will “fur up” on contact with moisture, creating a slight fuzziness where the board has absorbed moisture (this can also occur in a particularly damp environment). Don’t worry at this point, because we finish them to such a smooth condition that they won’t fuzz up too much. Additionally, any furring can be buffed back to a smooth state – you can do this using very fine sandpaper (240 grit or above), or a simple nylon scourer. Timbers with a wider grain will likely show the greatest change in texture – London Plane generally has a very tight grain so is less affected – British Elm, with its wider grain, will probably fur up a little more (this we feel, complements their rustic look and feel). 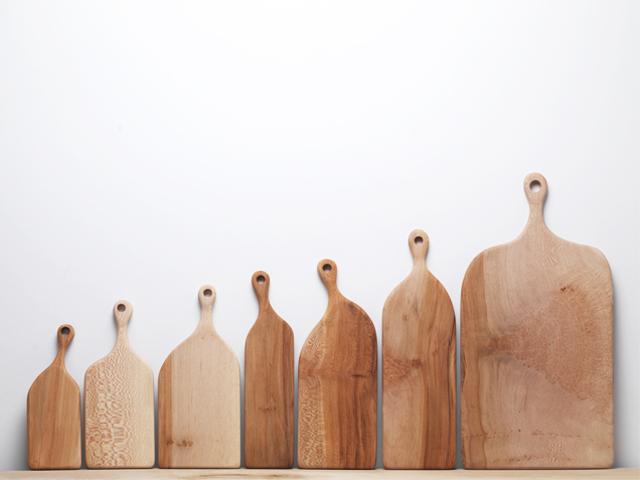 How do you finish your boards? We have developed our own board treatment that we call HW Wood Balm – we blend it here in Hackney and it is made of only natural ingredients; mineral oil, beeswax, carnauba wax, essence of orange and essence of juniper needle. It’s good enough for your skin. The mineral oil soaks into the board and conditions from within – it binds with the molecular make-up of the timber to help resist water. The waxes provide protection on the surface, by strengthening fibres and giving a good gleam too – this you will find builds up over time with further application, which is very satisfying indeed. The essences we include are for fragrance, and for their antibacterial properties. Should I re-finish my board? Yes. You’ll see the result is very satisfying – the board is nourished and its natural colour re-invigorated. You can purchase a tin of our Wood Balm, or another good quality board oil/wax that is out there. Alternatively, you can pour a little bit of natural food oil (olive, rapeseed, vegetable etc) into the centre of the board and rub in, making sure there is no excess remaining. Wipe off and you’re good to go, your board gleaming again. How do I apply HW Wood Balm? If you so choose, you can scour or lightly sand your board prior to application – this is not vital but will keep the surface smoother in the long run. 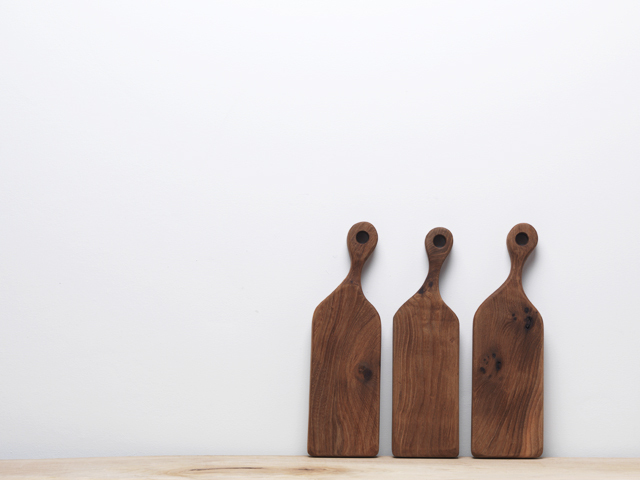 Start with a clean and dry board – if you have sanded it, dry-wipe or dust it off first. Grab a cloth – ideally a quality lint-free one, but this is not vital – paper towel also works fine! Take a small dollop onto the cloth and start rubbing along with the grain of your board, until the whole area has taken on some balm – you’ll know this once the colour has changed consistently. Ideally then leave for a few minutes to really let it penetrate, and then buff dry. This is best done in a circular motion with a fresh cloth or paper towel. You’ll see a slight sheen develop as you go – so buff all you want! A little goes a long way, and you’ll find that as the balm reacts to heat (that of your hand and its movement) it becomes easier to rub in. Will the board be damaged if I cut on it? 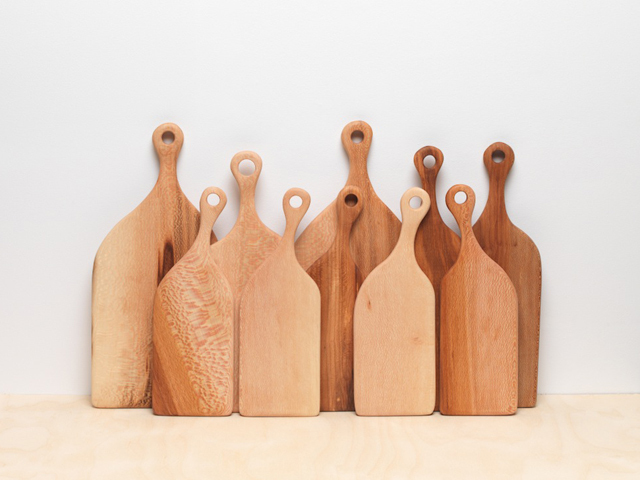 Only to the extent that it will become marked – we encourage people to not be too precious with their board, because although very beautiful, they are very hard-wearing and will last a lifetime.If worried about marking, we advise to chop on one side, and serve on the other. We feel a board gathers character through its scratches. 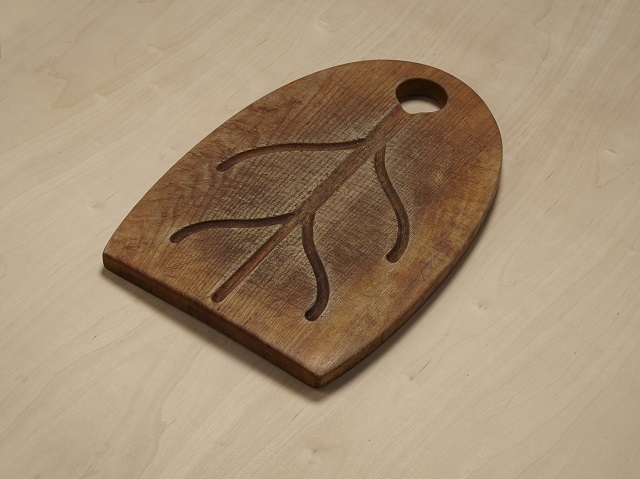 This can be seen from a bespoke Elm Carving board below – it got to this condition after approximately 1000 carved beef joints at Fortnum & Masons……..
Will certain foods stain my board? Yes. As you might expect, some foods will leave a lasting impression – beetroot, (sometimes) strawberries, red meat juices. Depending on how you see it, these stains can add to the board’s character, and will soon blend in. Alternatively, avoid cutting such foods on your board, and always wash off immediately after use. How long will my board last for? All being well, it’ll last a very very long time. There are no joints to come apart, and no real weak points; so if looked after, will last long enough to hand down to another generation. Along with the character you have given it over the years. We are very careful as we produce these boards, but it is sometimes impossible to know if a natural crack will appear several years along the line. If one does, just send your board back to us and you’ll soon have a new one. Please email us info@hampsonwoods.com if you have any further questions, and happy chopping/serving!